How can I afford a natural mattress? Why do non-toxic mattresses cost SO MUCH?!? These are two questions that everyone trying to clean up their health and their home has asked at some point in their life. No matter how much you know that getting the chemicals out of your life is important, the sticker shock of all natural bedding gets to you. It makes you question the need to change your mattress and whether it’s really worth it. Trust me, I know. 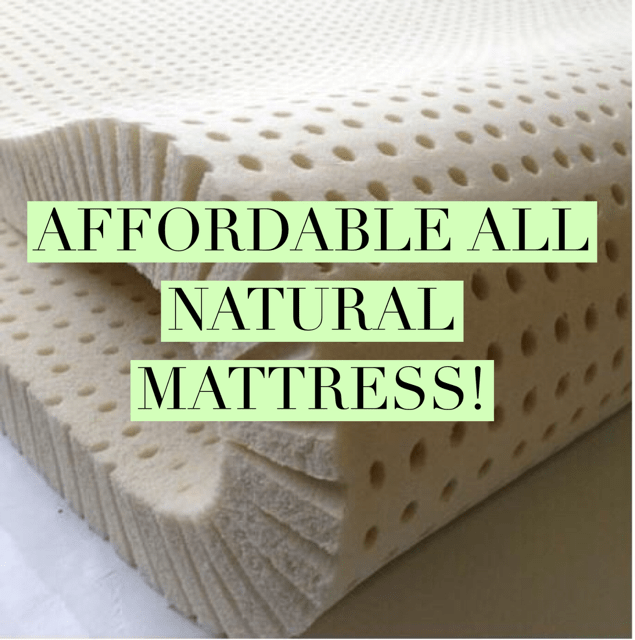 I’ve talked with some of the biggest personalities in the green lifestyle world over the years and we’ve all sheepishly admitted that an all natural mattress is the last thing that we have changed (or would, in the future) only because of the cost. Even though we know of the risks. Sleep on Latex has prices that made me do a double take. I read the listings and thought, is this really real? Which then made me delve even more into their story and what materials they use to make their bedding. I was determined to find the hidden reason why their all natural mattresses cost so much less. It even resulted in me emailing the young founder of the company, Karl Shevick. After all of that, I felt that I could truly recommend Sleep on Latex as a natural mattress solution. Here’s why. The Chicago-based company uses 100% natural latex to manufacture their mattresses, mattress toppers, mattress cores and pillows. Here’s the thing. 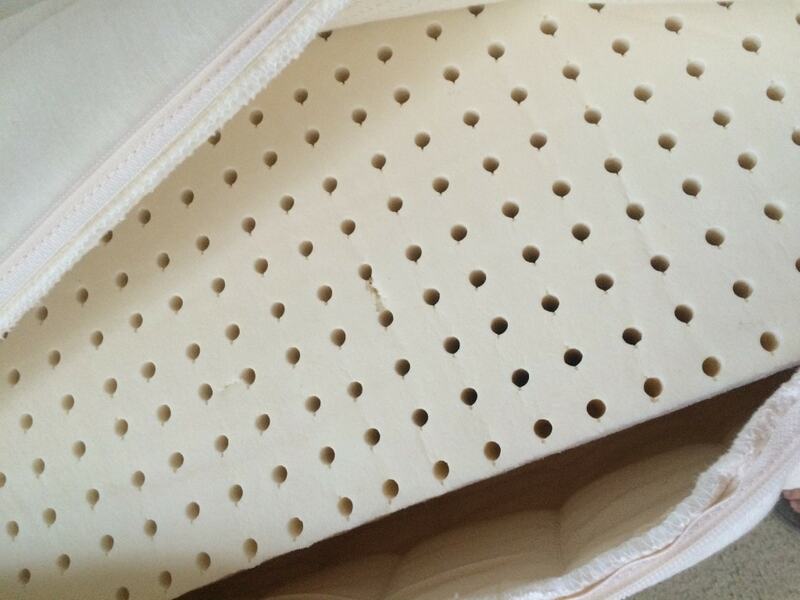 You WILL find many other companies that say they manufacture mattresses with natural latex. Manufacturing WITH an all natural ingredient and manufacturing a product ONLY from an all natural ingredient is completely different! Always read the wording! The natural mattresses from Sleep On Latex are made ONLY from natural latex that’s sourced from Sri Lanka. How does latex even exist in nature, you might ask? The sap of rubber trees is used to create natural latex. Pretty cool, huh? So here’s the next question. Sure, the latex might be all natural, but is anything added to it? I had the same doubts, too. After emails with Karl, I was assured that no chemical fire retardants are added to the natural latex, nor are there any synthetic latex or fillers. There’s also some pretty impressive certifications from the green living industry attesting to the quality. They’ve even passed the most stringent test from Oeko-Tex to be safe for babies and children. We ordered the Sleep on Latex Pure Green mattress from descriptions online. Do you know how nerve wracking that is?!? It’s really hard to get your head around ordering a mattress from online rather than test driving it in a store. It’s a leap of faith, for sure, but the rewards are great. What really helps is that Sleep on Latex offers you 100 nights to try out the Pure Green Mattress. If you don’t end up liking it, you can get your money back. So that really reduces the stress of trying to decide. 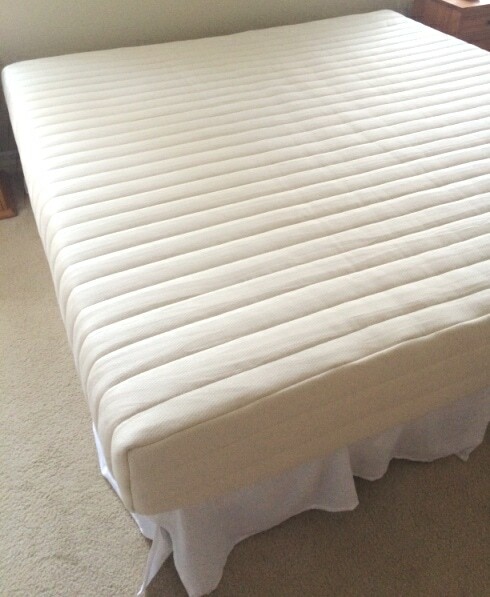 We ordered the Sleep on Latex Pure Green Mattress King Size, 9″ in Medium firmness. To say that I’m impressed by the Sleep On Latex mattress would be an understatement. This mattress is so comfortable that I literally marvel every morning at the fact that I can turn on my side in my sleep and not feel a spring poking me in my hip. I can move and change positions without getting “stuck” in the foam. It’s very supportive in the ways that I need it to be, and yet really soft and flexible in the ways that I want a mattress to feel. I have never, ever considered a latex mattress before (since most of the ones in stores are synthetic and full of chemicals) and I was questioning the decision to go from an innerspring mattress to a latex mattress. Now I’m so glad we did! The 9” mattresses is made of a 6” base layer of Pure Green foam and a 2” top layer of softer Pure Green foam. The two layers are bonded together with a natural latex adhesive. 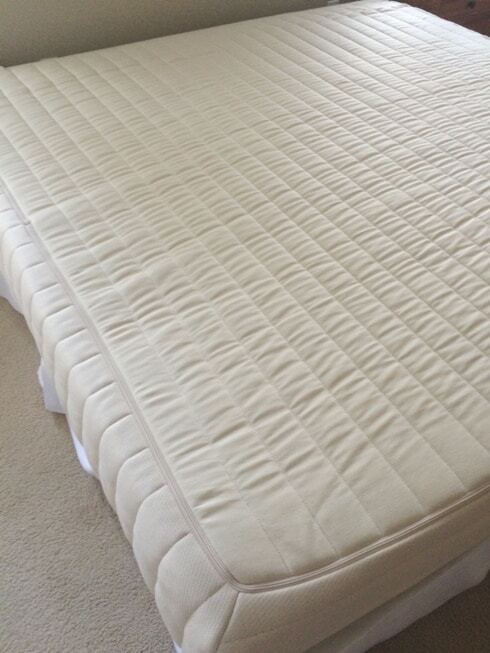 There is 1″ of New Zealand wool quilted into the mattress cover. This is important because wool is a natural dust mite repellent and a surprisingly effective temperature regulator – both hot and cold. The mattresses comes with a removable cover that has the zipper located underneath so that you’re not sleeping on it or hitting it in the middle of the night. 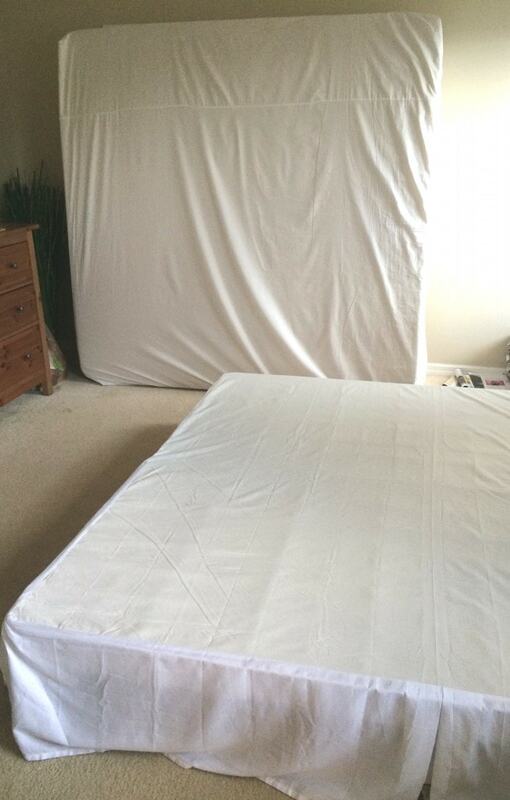 Should you need to clean the mattress cover, it can be removed. Dry cleaning is recommended. We put our new Sleep On Latex mattress on our existing box springs. We kept the old mattress in our bedroom against the wall for a month, making darn sure that we liked the new bed and weren’t going to need to resort to going back to the original mattress. The only thing that did not make us happy was our freight delivery service which overpromised us on what they’d do. This has nothing to do with Sleep on Latex, but there are some helpful hints that we found out that you need to be aware of for when you buy your Sleep on Latex all natural mattress (and I DO suggest that you look at the online store!). 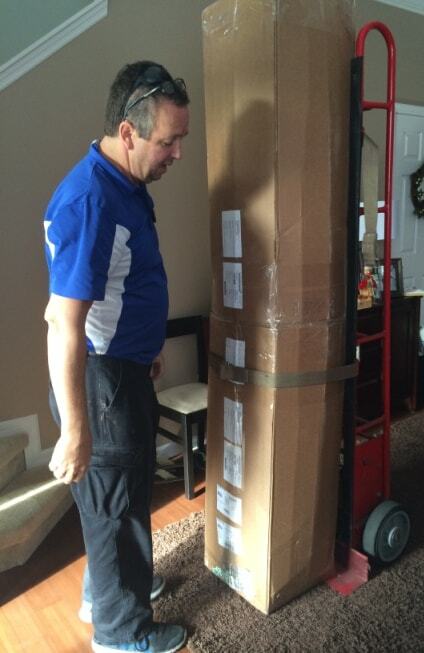 The King size mattress comes residential freight (most other orders come via FedEx). 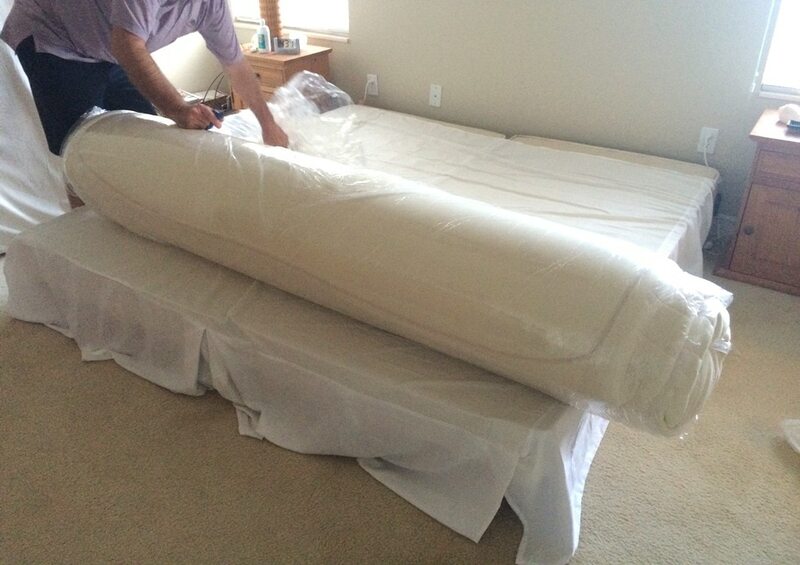 The mattress comes rolled up in a roll inside a cardboard box and weighs a whopping 160 pounds because of its density. For this reason, you MUST have someone who is physically able or has the appropriate dollies or other equipment to move the box. This isn’t a White Glove delivery service, like most other mattress deliveries (that’s why the costs can be so low so that you can afford it!). Freight delivery services and FedEx aren’t going to come into your house, remove your old bedding, unbox the new mattress and set it up. If you need someone to do that for you, you need to set that up in advance! We live in a two-story home with the bedroom on the second floor, so trying to get a long 160 pound box up the stairs with just one person is almost impossible. 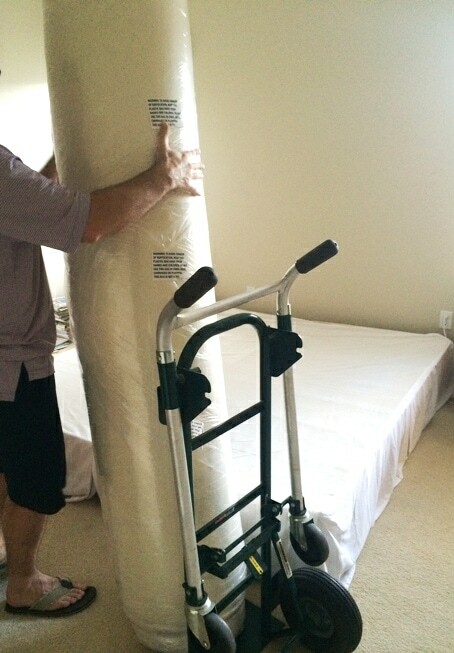 Have friends, family or neighbors on hand to help you, if you order the King size mattress. 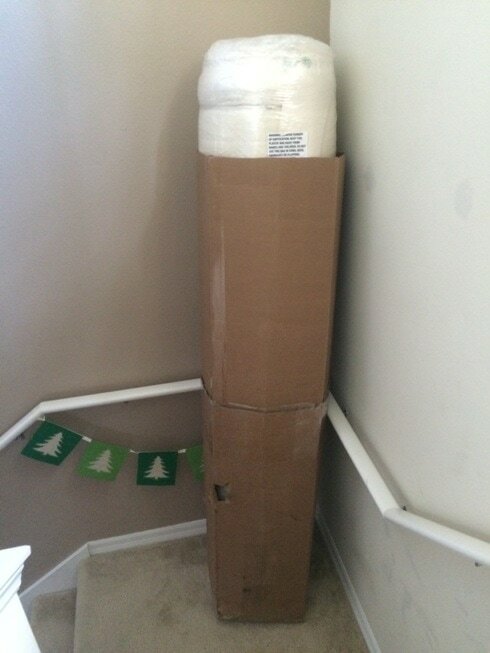 Not sure if you want to order a mattress online? Why not try out Sleep on Latex’s mattress toppers (Available on Amazon!) first to make your existing bed more comfortable or to see if you really like natural latex bedding? Got specific needs (such as RV compatible mattresses, day bed mattresses, mattress for a tiny home, boat mattresses, cribs, child mattresses or more…)? You can build your own mattress, too, with a combination of cores, covers, mattress toppers and other 100% natural latex bedding items. It used to be that healthy sleeping was only for the rich (or those really in debt). Today with Sleep on Latex products, healthy sleep is now more affordable than ever before! Many thanks to Sleep on Latex for providing me with a mattress for review. I was not compensated for this post. Payment enough is being able to share my completely personal opinions on how much greater I am sleeping every night. For anyone struggling to get a good night’s rest, you know how valuable a good night’s sleep can be. Sounds great. I know you have been wanting a new, natural bed for quite awhile. Loved the video. Had to giggle at the ‘we’ set it up.. looks like your hubby did a lot of the work. But you did a great job videoing!! ;-). Enjoy. Looking forward to hearing about how it turns out in the long run. Any new thoughts on your mattress? I’m considering getting the same one. Yes, Nichole! I really, really love my mattress still! If I had it to do all over again, I’d still get this one! It’s not too soft, not too hard and really is so comfy. Be sure to watch my video for more info. I am a big fan of this mattress and how accessible it is for everyone. No pressure points when you’re sleeping, either, which is fabulous! And no allergies when I wake up!!!! And if you’re really going to buy one, I sure would love if you used the link from my site via Amazon. It helps us out so much at no cost to you! Do you have a coupon code for this? Also, do you know anyone else (even blogs or YouTube videos) that purchased the 7″ for 2 people and what they thought about that one?) Thanks! Yes I also wanted to know if you had a coupon code..? I don’t have a coupon code. i dont mean to be a sore, but I believe your definition of affordable is way different then most of the families that need an affordable alternative. Their twin mattress is $649??? As a single low income mother working hard and trying to provide the best for my son this article really excited me and then dashed my hopes when i looked at the prices on Amazon and their direct website. i guess you have to well off to deserve a healthy mattress in this country. Yes, everyone’s definition is different. 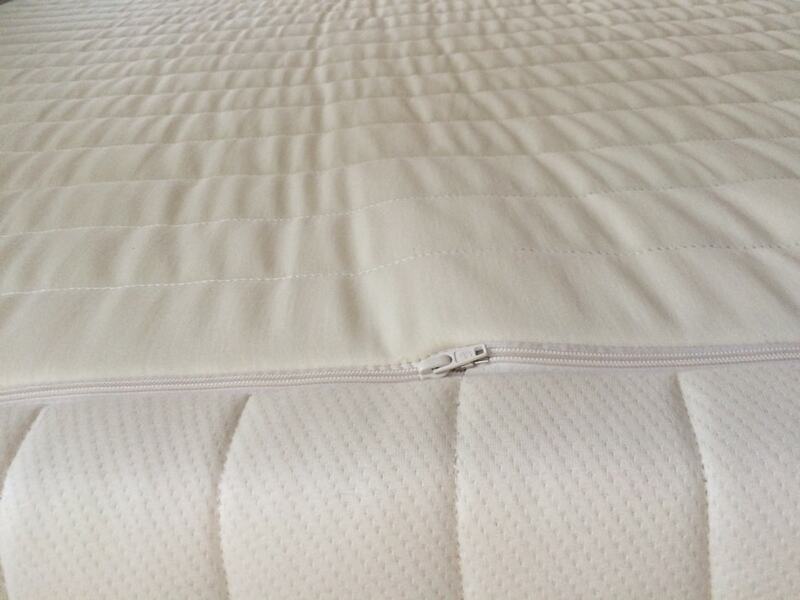 Affordable meaning compared to other non-toxic mattresses available for sale. I’m in no way saying they are as cheap as conventional mattresses. Definitely not. Try the Futon Shop. They have some chemical-free twin mattresses for less than $500. But yes, healthy mattresses are expensive. You get what you pay for. Ana, I’m so glad to hear this! I hope your kiddos love the beds, too. I STILL absolutely love my Sleep On Latex mattresses (I have 2 now – one in my RV, as well)! Let me know how you like them! And I think you just might be getting a new bed for you and your hubby, too 😉 Sleep Well!